Family owned and operated since 1914, we are known throughout the metro Boston area for specialty and hard to find tire sizes, high performance tires, brakes, alignments, batteries, cooling systems, exhaust, mufflers, shocks and struts, transmissions, scheduled maintenance, state inspections, tune-ups, oil changes and much more! Offering competitive prices, nationwide warranties, and quality new and used tire products such as: Goodyear, Dunlop, Michelin, Bridgestone, Firestone, Pirelli, Continental, Nokian, and automotive repair services, it's easy to see why our loyal customers have their vehicles serviced at Advance Tire year after year. Convieniently located at 185 Broadway in Kendall Square, Cambridge just minutes away from the Kendall Square T (on the red line). Our professional, courteous staff is here to help you 6 days a week. We are equiped with 7 bays to service your car quickly and get you safely back on the road. 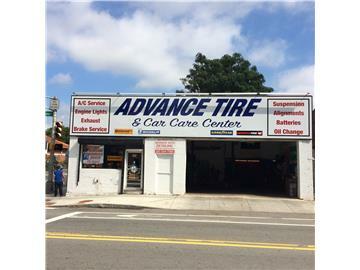 For honest, reliable and friendly service, come to Advance Tire Company, your high performance tire specialists.